Is your rat cage a little boring lately? Want to spruce it up with new toys and accessories, but don't have the budget for it? There are a number of sites on the web that can help. 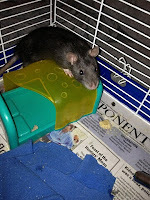 On Squidoo is a page with a variety of projects you can make yourself with no sewing or special skills required: http://www.squidoo.com/simple-and-easy-ways-to-accessorize-a-rat-cage. This site shares some no-sew hammock ideas, along with projects like a paper mache dome hideout, rope ladders, beds made from hats, and hideouts made from baskets, flower pots, and ice-cream tubs. 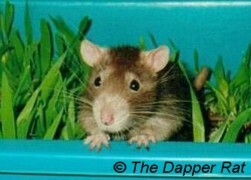 The Dapper Rat (http://www.dapper.com.au/toys.htm) also has a page with innovative toy and activity ideas for your rat. This page is full of ideas, including instructions for a rat dig box, a rattie clubhouse, and a rattie wading pool. 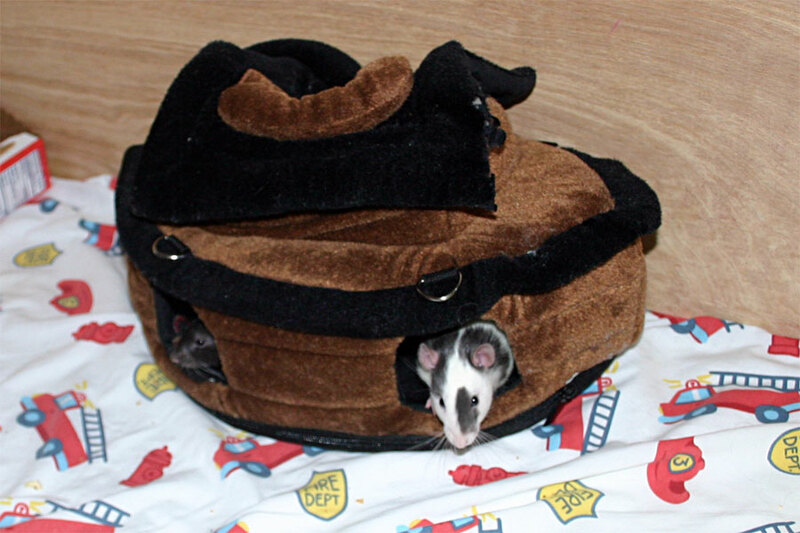 And if you are looking to deck out your cage with new hammocks, but you don't have a sewing machine - don't sweat it. Suz' Sugar Gliders (http://www.suzsugargliders.com/nosewaccessories.htm) has instructions for a variety of no-sew hammock projects that will work just as well for rats. 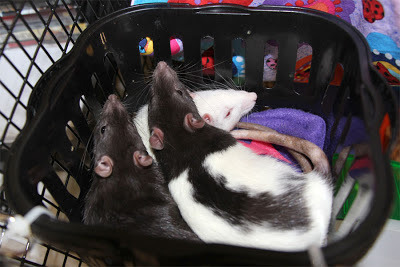 And for those who do sew, don't forget our rat hammock tutorials at Ratropolis.com (http://www.ratropolis.com/Rat%20Tutorials/RatTutorials.htm). Sometimes, the answers to our rattie questions are complex and a simple solution cannot be found in a book or a web search. Sometimes, we just need to talk to someone else who understands rats - someone with more experience and insight. Sometimes, we want to help others by sharing our own experiences. And sometimes, we just want to have a place to share our rat stories, our rat problems, and our rat pictures with people who have the same passions and interests. 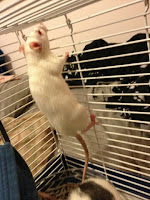 Rat Care Corner - for topics regarding health and proper care. 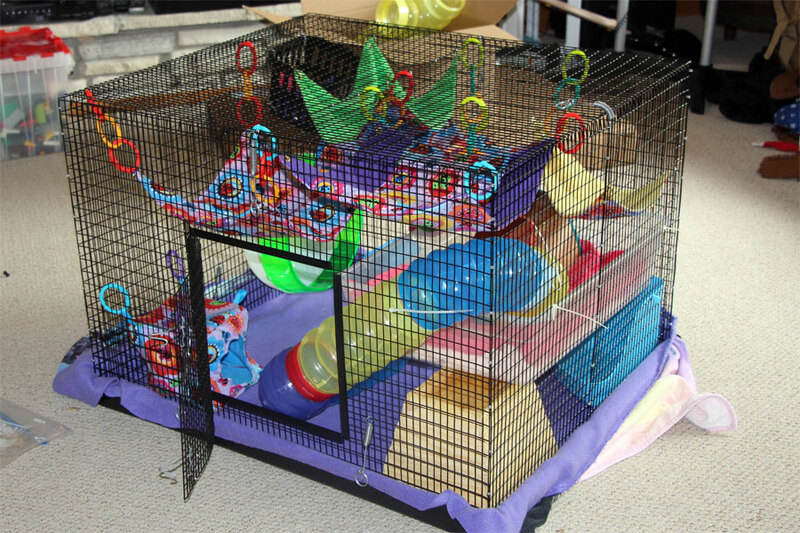 Home Squeak Home - for topics relating to cages and cage accessories. Rat Tales and Mugshots - for posting pictures of your rats, memorials, rat stories, and anything that doesn't fit anywhere else. Pack Rat Swap Meet - Marketplace - for vendors of hammocks and other rat-related products to advertise their wares. Pack Rat Swap Meet - Classifieds - for listing of one-time only items wanted or for sale/free. Members are friendly and helpful and most posts receive an answer fairly quickly. There are a number of extremely knowledgeable regulars that are available to help out with the more complex questions. The forums are always active - there is always something new to look at or read about. This is a pet owners' forum, not a breeders' forum, and a strong emphasis is put on rescues and adoption. Thus, people seeking help with planned breeding efforts might be better served on another venue - although there are a few experienced breeders that do help out on that forum, and there is always help for those who find themselves with an accidental litter. The Home Squeak Home forum includes threads dedicated to Martin cage setups, Critter/Ferret Nation cage setups, and other cage setups, so members can share pictures of their rattie homes and others can get ideas from them. The Adoption Center is a great place to find your next rat. 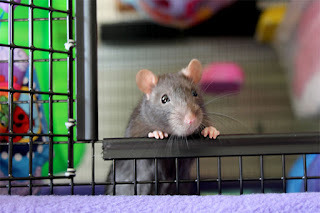 Several rescues and foster homes regularly post their available rats and many help with setting up rat trains so that even those who live far away from any rescues can have an opportunity to adopt. Members who find themselves with an oops litter can also use this forum to find good homes for the babies. If you want to deck your cage out with cleverly themed hammock sets but you aren't much with a sewing machine, the Pack Rat Swap Meet - Marketplace will help connect you will someone who can help you out. Many vendors will accept custom orders and there are also pre-mades that are ready to ship available as well. And if you are handy with a sewing machine, and have been a member for 3 months and 100+ posts, you can set up your own marketplace shop and sell your hammocks to members. If you are downsizing and want to get rid of some of your extra cages or supplies, you can post them for sale in the Classifieds section. And if you want to expand your pack and need more cage space, you can find deals on used cages and supplies here as well. In books, television, and movies, rats tend to be portrayed as evil sinister characters, which is a far cry from their real-life personalities. It is nice to call attention to those works that think outside the box and offer a positive portrayal of these wonderfully personable and intelligent animals. 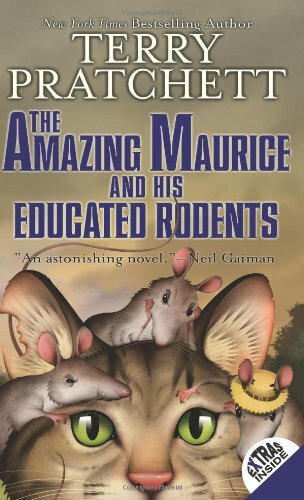 Today, I would like to recommend a young adult fantasy novel, winner of the Carnegie Medal, from Terry Pratchett's Discworld series: The Amazing Maurice and his Educated Rodents. Despite being part of a series, this book stands alone and requires no prior knowledge of the Discworld universe. This novel is a delightful but dark play on the Pied Piper fairy tale, centering around a group of rats who developed intelligence and self-awareness when they ate from the garbage bins at a wizard university. They are led by Maurice, a cat, who became enlightened when he unknowingly ate of an affected rat - an act which haunts him throughout the novel. Maurice invents a Pied-Piper scam with the help of the rats and a "stupid-looking kid" (piper), to defraud unwitting town governments of money by faking a rat plague. The rats are not convinced they are doing the right thing, but agree to help Maurice one last time. Unfortunately, deep down beneath this one last simple looking town, a terrible evil lurks . . . . This novel is witty and entertaining and suspenseful and it brings to life an entire cast of rats - each with their own unique and memorable personality, and each one endearing in his or her own way. Whether the rat loves the old (wild) ways or is enchanted by new enlightenment, they are all treated with respect and integrity and love by the author. This book can be enjoyed by young and old alike - I read this book aloud to my boys (10 and 12), and they both enjoyed it as much as I did. If you are not a book person, BBC Radio developed a radio play dramatization, featuring the voice talent of David Tennant (Dr. Who's 10th Doctor) as the wise but nearly blind rat, Dangerous Beans. I could not find this play available for purchase, but you can listen to it in 6 parts on YouTube. 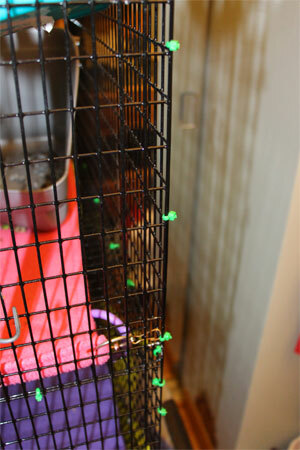 We recently purchased a Martin's Rat Play Pen with Pan from Martin's Cages in Columbia, Pennsylvania. We hadn't considered buying one in the past because we always have had designated rat-safe areas of our home where the rats could come out and play. These areas work better for us, because we can be there with them and interact better. While the Martin's play pens allow you to sit inside when you raise the flip-top lid, the space is cramped and the rats can climb up the walls and out if the lid is raised. So what changed our minds? 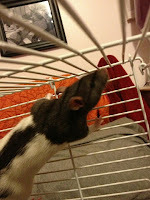 We needed to get a new cage for quarantining new rat additions to our family. 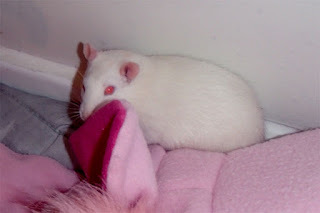 Loki, living alone, currently resides in the cage we otherwise have used for quarantine. A new cage is expensive - even the pet store cages suitable for rats are pricey. And if we were going to spend that much money, we would rather spend it on a quality cage. Midwest Critter Nation cages were out of the question, as that is simply too much for a cage that currently would only be used for a few weeks during quarantine. Se we looked at getting another Martin's cage. But one problem with getting another Martin's cage just for quarantine is that it can't be easily assembled then disassembled - even if you put it together with zip-ties. Since we would be storing this cage after quarantine, having something collapsible for storage was ideal. 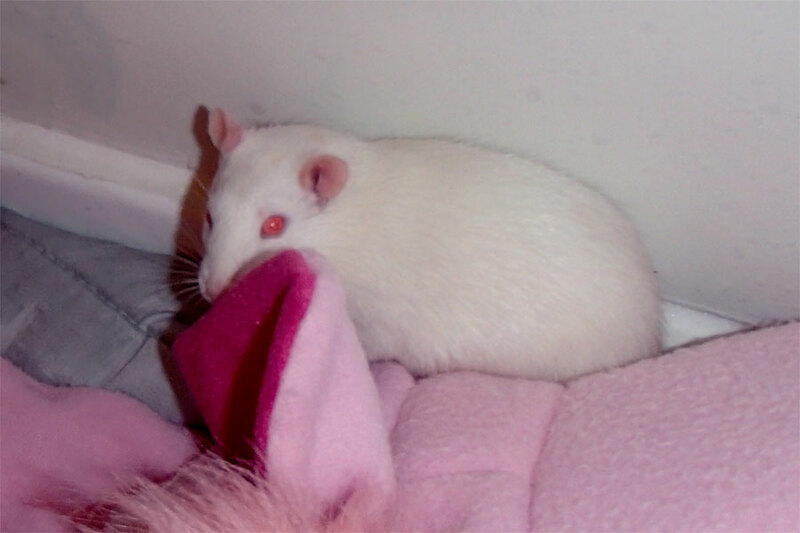 That was when I really took note of the Martin's Rat Play Pen with Pan (some of the play pens do not come with a pan and simply sit on the ground - those would not have met our needs). The play pen was actually a little cheaper than the smallest cage suitable for a pair of rats. It includes a pan similar to the pan their cages come with, and the pen is latched to the pan with spring hooks. It also includes a flip-top lid for putting the rats in and out. The entire pen collapses for easy storage. It is not ideal for use as a cage, because it does not have levels and it does not have a cage door. However, Martin's accepts custom orders, and we found we could add a door for just $10 more. So we ordered one and attached a large shallow storage bin to on side as a second level. Not an ideal cage for every day, as there are some areas that are hard to reach through the door, but for a few weeks, it is just fine - and plenty spaceous as well. 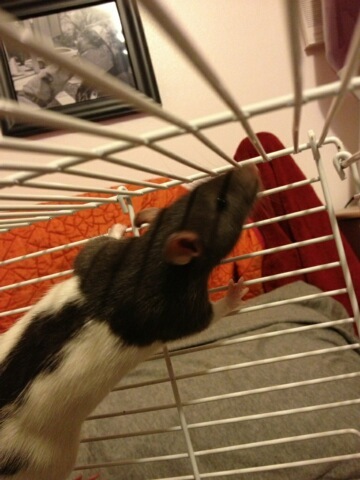 It is also nice that both sides of the top flip open, making it easy to pet a rattie through the top. ﻿﻿But what made ordering a play pen for quarantine really worth it? : when quarantine is over, we can use it for its intended purpose. A cage would just be stored away, but a play pen has future use. Why would we want a play pen when our rats get out time in larger areas? It can be set up outside. Sometimes we like to enjoy some nice weather out on the deck. Now we can bring the rats out with us, but keep them safe from predators and parasites and just getting lost, by using the play pen. The rats always seem to enjoy the smell of the fresh air, and the play pen makes it safer for us to let them come out every now and then. It can be set up in any room of the house, carpeted or not, rat-safe or not. We can put them in the play pen for some play time while we are watching TV in the family room or having company in the living room. We can have them out in the play pen even when the dogs are around without having to be extra vigilant. It can be used as neutral territory for introductions. Of course, this assumes it is has not been used for quarantine, or it is no longer neutral. It certainly doesn't replace true out-time with us, but it gives us more opportunities to take the rats out during times when we can't focus solely on them. It gives them a second environment to explore with toys that won't fit in their cage. And when we get more rats, we won't have to worry about investing in another quarantine cage if all of our traditional cages are in use. We have been away for a while on vacation in Florida, so posts have been scarce. But we are back now, and on our way back, we picked up three beauties from the Exotic Animal Rescue and Pet Sanctuary (EARPS) in Indianapolis, IN. Our trip brought us right through Indy, and EARPS had rats available from a pet store confiscation by animal control. EARPS is a great rescue, taking in all sorts of exotics, and providing the required veterinary care and spaying/neutering all animals as long as it is medically safe to do so. We adopted three baby girls. Meet Bela (black hoodie), Ruby (pink-eyed white), and Jo (black self). We named them after female characters from the series Supernatural (a challenge, since female characters don't usually stick around long on that show). These girls are really amazing. They all get along great together, sleeping in one rattie bundle, usually in a tiny basket in the upper corner of their quarantine cage. So far, they appear perfectly healthy - not a sneeze out of any of them, and one of their rescuers said that she had not seen any sneezes from them at all when they were with her either. They can be a little skittish with sudden movements, but they are not shy and will come scampering right back when they realize all is fine. They are super friendly and do not bite. It is very hard to get a good picture, because they are either sleeping together all entangled in each other, or they are scampering about at the speed of light, exploring their surroundings. It is no surprise that their favorite activity is flying inside their Silent Spinner wheel, apparently trying to reach the top in a futile but adorable effort. All three love the wheel and they often run two at a time in an apparent race to the top. The three girls are currently in quarantine, but eventually will be introduced to Pirate. We are keeping our fingers crossed that introductions will go well. 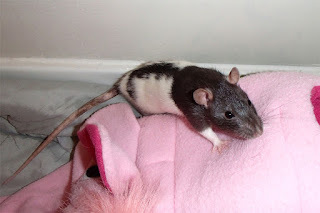 Hopefully, the fact that the new ratties are all female and young (and spayed of course) will help things along. Every rat loves a good plastic hideaway, but none are so unique as the Lixit Critter Space Pod. It's rounded "space-ship" shape make it a favorite among the Ratropolis rats. It is designed in such a way that it can either stand up on the ground or hang upside down from the cage ceiling. It works well in Martin's cages and in Critter Nation cages, although I zip-tie the legs to the top of the cage to prevent it from accidentally falling off. 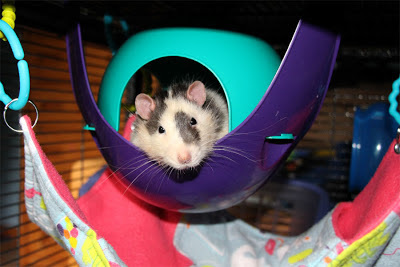 I also like to hang a flat hammock beneath the pod so that rats can enter and exit easily. A lot of huts and houses are interchangeable - you can use a wooden one or a plastic igloo, but a plain ordinary cardboard box will work just as well and be loved as much. The Critter Space Pod, on the other hand, definitely stands out for both its uniqueness and for the preference the rats show for it over other options. Unfortunately, the Critter Space Pod is not available in any pet stores that I have ever seen, but it can be ordered online from Amazon and other places. Rats will require the "Large" size linked to above. This is one that is definitely worth spending a few dollars on - don't be surprised if all of your rats don't try to cram their way inside as soon as you install it. Martin's cages are quality cages, but once assembled, cannot be easily broken down and stored. They use metal C-rings to attach the panels, and these rings are not only somewhat tricky to install, they are difficult to remove. 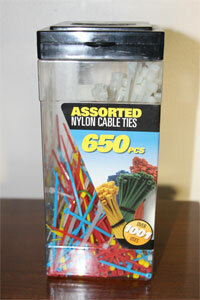 We highly recommend storing the C-rings away, and assembling the cage using zip-ties instead. That way, if you put a panel on upside down or facing the wrong way, it is easy to fix. And when you no longer need the cage, you can simply cut the zipties, break down the cage, and store it away. The zip ties are attractive and they are sturdy. Our Martin's R695 has been assembled this way for over a year and none of the 5 rats we have had have ever chewed through any of them. In about two weeks, we will be adopting three sisters from from the Exotic Animal Rescue and Pet Sanctuary in Indianapolis (EARPS). I believe they were from a litter rescued when Animal Control raided this pet store (http://www.wthr.com/story/21646940/hundreds-of-animals-confiscated-from-east-indianapolis-pet-store). The adorable PEW (pink-eyed white) was spayed today. The other two will be spayed on Tuesday. Then, after coming to their new home and undergoing quarantine, we will start the introduction process with Pirate. There are a few websites that every rat owner should save in their Favorites. The Rat Guide (http://ratguide.com/) is first and foremost. The Rat Guide is divided into 4 sections: the Health Guide, Care Guide, Medication Guide, and Breeding Guide. 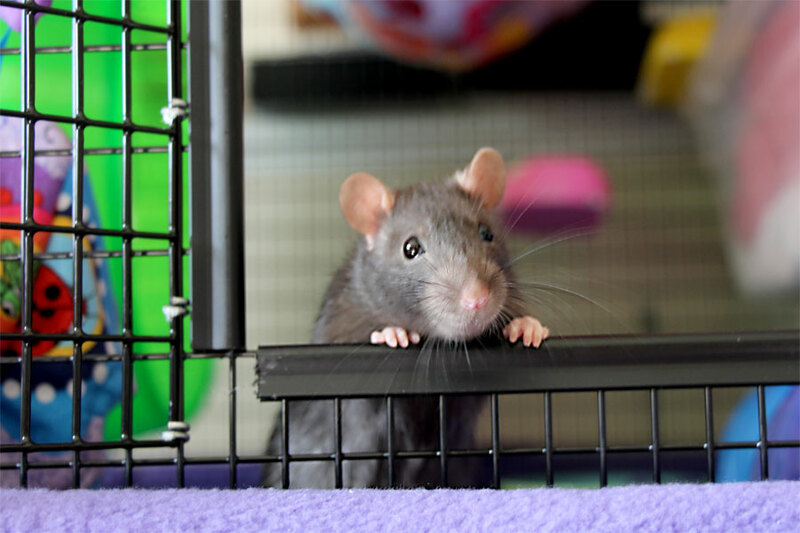 The Care Guide covers your basic rat care - everything you need to know when you are planning to get rats. 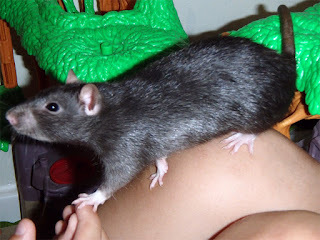 The Breeding Guide helps rat owners with oops litters (it is not uncommon for a pet store rat or a Craig's List rat to go home with you secretly pregnant) as well as dedicated breeders. It is the Health Guide and the Medication Guide that I find to be invaluable resources that are not duplicated anywhere else. Most of the common and not-so-common health issues are covered in the Health Guide, along with symptoms, diagnosis, treatment options, medication dosages, figures, and case studies. No where else on the web can you find this detailed information on the potential medical conditions that could be affecting your rat. The Medication Guide covers many medications that can be prescribed for rats, what they are prescribed for, and what dosages are safe and effective for which conditions. These guides are not a do-it-yourself treatment protocol. Most medications require a prescription and diagnosis and treatment likely require a vet. Instead, this is an excellent resource for both before you take your pet to the vet - so you can know what to expect and you can be ready with questions - and after seeing the vet - so you can better understand the treatment protocols and medications that your vet prescribed. If there is any drawback to the Rat Guide, it is that it leans on the technical side. There is no getting around that. If you want the facts in detail, it is going to get technical. However, sometimes this makes it hard to find the information you are looking for. For example, if I am looking up Baytril in the medication guide, there is no category listed for "antibiotics" - which is where I would expect to find it. Instead, it is listed under the slightly more obscure term "antimicrobial agents." If you are not familiar with medical terminology, it can sometimes require a little digging to find the article you are looking for. There is a search function, but sometimes the search fails to locate articles that I know exist on the website. Those drawbacks are minor, though, and you will soon find yourself familiar with the organization, layout, and content of the Rat Guide, and we are all very lucky that such a resource is available to us.